Manicured, improved hay pastures roll gently into thick hardwood forests on the Clay Hill Ranch, which, by any measure, is an exceptional property. With nearly 4,800 +/- contiguous deeded acres, this East Texas ranch is uncommonly large for the area and very productive. Approximately 750 cultivated acres have historically produced an average of 9,000+ round bales of hay in three cuttings per year without livestock production. The owner has recently implemented a cattle feeding program designed to accommodate an Angus herd consistently grazing up to 800+ head under rotational grazing while maintaining a significant hay crop yielding 2-3000 4&apos; x 6&apos; round bales. Two large live creeks, numerous creek draws, two lakes stocked with fish, and more than 22 stock tanks provide ample water for livestock and wildlife. Numerous large potential lake sites exist throughout the ranch. Managed wetlands attract migrating and resident waterfowl. And then there is the game, large and small, whitetail deer, wild hogs, and doves. It is no wonder that thousands of years ago the Caddo Indian culture flourished here. The improvements on the Clay Hill Ranch are well considered and beautifully maintained. A custom stone ranch house, completed in 2011, has 5 bedrooms and 4.5 baths in 5,898 +/- square feet, with adjoining guest quarters for family and friends. Operational facilities include a 10,000-square-foot equipment barn and office, two modular houses for hunting parties, and a manager&apos;s residence. Located a short distance from Interstate 45, the Clay Hill Ranch is less than two hours driving time from Dallas and less than three hours from both Houston and Austin. Location, productive agriculture, beautiful terrain, abundant wildlife, and gracious and practical improvements - the Clay Hill Ranch is all encompassing. THE LAND: As the story goes, Freestone County, carved from the larger Limestone County in 1850, was named for a type of indigenous stone found here, though the soil is not particularly rocky. Throughout the county, the soils vary from loamy to claypan with a sandy or loamy surface. On the Clay Hill Ranch, Bermuda grasses and strategically planted food plots for wildlife thrive in the sandy loam soil. At least six types of oak trees - red oaks, live oaks, sand oaks, post oaks, pin oaks, and water oaks - grow in dense groves and forests along with ash, blue jack, elm, and black walnut trees. Junipers give cover to wildlife, river birch grow along the creeks, and bursts of white dogwood blossoms herald the arrival of spring. East Texas beauty abounds over every rolling hay filled pasture and through the dense hardwood canopy. THE STORY: Every place has its story and so it is with the Clay Hill Ranch. Gunfights, Texas Rangers and Moonshiners first brought this ranch into notoriety. This story begins with moonshine - a hot commodity in Freestone County during Prohibition - and ends with a deadly shootout. In 1928, newspapers breathlessly reported on the Freestone "Moonshine Wars." The story has only enlarged with time. What happened was this: Texas Rangers were sent to bust up the stills, which the moonshiner didn&apos;t take kindly to. Shots were fired and a ranger died. More rangers were sent for the moonshiner and his sons. They didn&apos;t go quietly. Another gun battle ensued and to no one&apos;s surprise, the moonshiner died in a hail of bullets. His cabin still stands today on the ranch, a relic of a bygone era. CLIMATE: Summers are typically Texan-hot with July highs in the mid-90s and occasional rains interrupt to cool things off. Winters are pleasantly mild with January highs in the upper 50s and lows in the mid 30s. Freestone County receives about 42 inches of precipitation a year, almost all of that as rain. Cattle- In addition to the production of superior hay, Clay Hill Ranch pastures are currently being grazed by an Angus herd owned by a notable producer of all natural premium beef. While ranch ownership is not interested in stressing improved pastures, rotational grazing practices yield conservative carrying capacities up to 800+ head while simultaneously harvesting between 2000and 3000 4&apos; x 6&apos; round bales of hay per year. 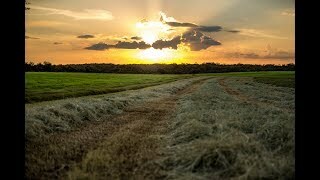 Hay & Forbs- About 750 acres planted in Jiggs & Tifton 85 Bermuda grasses produced an average of 9,000+ 4&apos;x 6&apos; round bales per year from three cuttings prior to running cattle. The horse-quality hay has been tested to have a protein factor of 17 or better. Many of the pastures have been over-seeded with Ball Clover, a legume and natural fertilizer that restores nitrogen to the soil when it dies off in late spring. WILDLIFE: Clay Hill Ranch is known for its excellent hunting opportunities - so good, in fact, that East Texas Outdoors Magazine has written about hog hunting on the place. The oak groves, hardwood forests, creeks, and food plots create a terrific habitat for whitetail deer and wild hogs. On the low-fence ranch, where hunting is fair chase, the deer population has been judiciously managed with supplemental corn and protein feed placed at strategic sites. While it is typical to see a 120-130" buck on Clay Hill, this ranch is also home to larger Boone and Crockett sized deer in the 170-180"class. This Level 3 ranch in the Texas Managed Lands Deer Program, the past 18 years of voluntary habitat management have attracted Freestone county&apos;s finest. Reports and details available upon request. The Cabins- The hunters&apos; cabins are nestled in a grove of hardwood trees. In the center of the camp is an outdoor kitchen with a custom wood fired pit that doubles as a wood-fired grill. Concrete pathways connect the cabins and the outdoor cooking/ gathering area lending itself to moonlit fires, family events and the hunting parties basecamp. Covered Cattle Pens- Constructed in 2018, in close proximity to the headquarters, is an 80&apos; x 80&apos; covered cattle handling facility. BROKERS COMMENTS: Clay Hill Ranch is one of the finest low- fence, large ranches in central/east Texas with beautiful rolling terrain and inspiring vistas. The property has been very well managed to promote outstanding livestock/hay production and wildlife habitat. Large populations of whitetail deer, wild hogs, ducks, and dove together with stocked lakes present excellent recreational opportunities for hunting and fishing. Top-quality improvements, live water, contiguous acreage, hardwood timber, minerals, and proximity to Dallas, Houston and Austin make this ranch a rare find.